An increasing number of businesses are choosing to use debit and credit cards to make all of the purchases for their companies. The Consumer Financial Protection Bureau reports that the average amount of debt on credit cards has substantially increased for consumers. Overall, credit card debt in the U.S. has reportedly reached 0.83 trillion dollars. In order to avoid the problems that are associated with carrying high credit card balances and to make purchasing easier, some businesses are opting to use business debit cards instead of credit cards for their purchases. While this can help companies to track their expenditures more easily, they need to save business receipts for everything that they buy to prove that they paid or charged sales tax on the things that they bought and sold. Auditors will ask to see all of the receipts for a business, and if you are unable to produce them, your company may end up paying sales or use tax twice. Collecting and tracking business receipts can be a real problem for businesses. Employees may forget to get copies of the receipts, or they may be lost. Businesses are required to save their receipts for as long as four years in case they are audited by the taxing authorities. If they can’t find the receipts for specific purchases, they may be charged sales or use tax for them even though they paid the taxes at the time of the transactions. The ink that is used on the receipts also can fade with time, making the receipts impossible to read. What sort of expense management tools can be used to solve problems? Fortunately, there are several expense management tools that are available today that can help to solve sales and tax use problems. Small businesses should make sure that they have good expense management systems in place, including for collecting and storing business receipts. Small businesses should start by drafting employee expense policies so that the employees who make purchases know to always get copies of the receipts for every purchase. Business debit cards from companies like Bento for Business can be used to restrict the purchases that employees can make by spending categories. This can help to track the company’s spending, keep expenses in check and prevent fraud. Online receipts can help to prevent some of the problems that are associated with collecting and saving paper receipts. 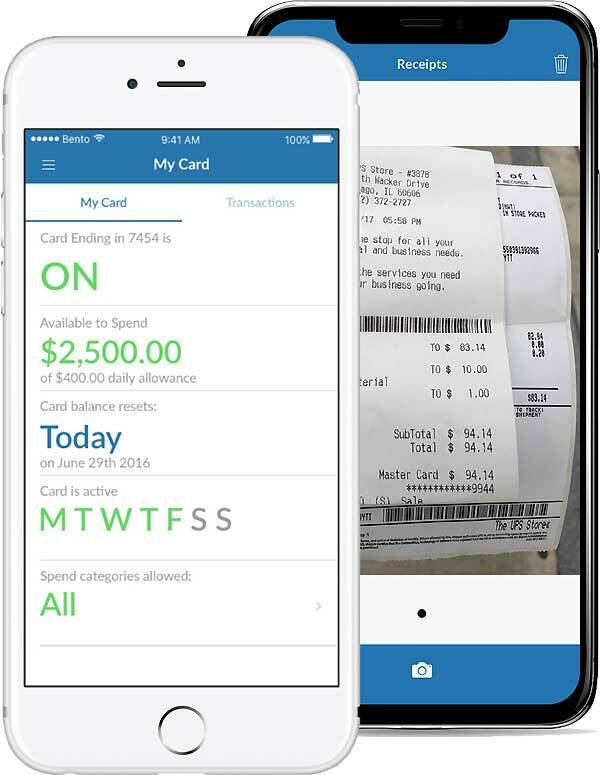 Your employees can simply take pictures of the business receipts with their smartphones at the point of sale using the mobile app, and the electronic receipts will be instantly stored with the purchase records in your account information. The data is integrated with your company’s own accounting software so that managing your expenses and your purchase records are simple. Who can benefit the most from electronic receipts and expense management? Small businesses can derive the most benefit from using online receipts to have readily accessible records of their business receipts. This can help business owners when they are being audited to quickly produce receipts for any purchase or sale so that they can prove that sales tax was paid or charged. Using the business debit cards from Bento for Business can eliminate other problems such as time spent on completing paper reimbursement requests and processing, losses due to waste and fraud and ballooning business expenses. Bento for Business offers terrific solutions for small business owners who want to prevent fraud, have a tighter lid on expenses and have better record keeping with online receipts. The business debit cards can be limited by business owners to specific dollar amounts for each card and to certain purchases. They do not require credit approval and so will not impact your credit. The application process takes less than 60 seconds and is simple. Bento has a useful mobile app that communicates the information about each purchase that is made directly to your account, and your employees can use their mobile devices to take pictures of receipts at the time of the transaction that will be sent automatically to your account. To learn about our 60-day free trial or to get started now, call us at 866.220.8455.